Memorial Day weekend, we were excited to camp for 3 whole days without moving from one spot to another and setting up and taking down every day. We also had never camped near the Columbia so we were pumped about that. We had picked out what we thought was a great site, views of the river and all. Soon, though, we realized this was not the perfect spot as the wind made it very difficult to set up our tent and made every effort to tear it down once we got it up. A big tent does not do well in the wind and our puny tent poles caved in under the pressure. We hadn’t even brought extra rope like those better prepared around us. The wind was loud against the tent walls at night and even eating was not as enjoyable as everything wanted to blow away. (Though we did made these very delicious flatbread pizza/panani things over the fire). We made due for two nights but decided to call it quits early. To be fair, these circumstances were also compounded by the fact that we had done two long hikes back to back days and were very tired. Further, the latter hike, Dog Mountain, left us disheartened. 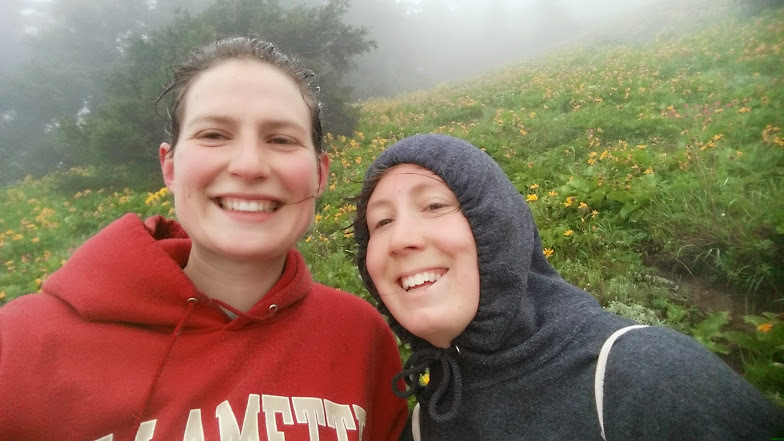 It was supposed to have great views but ended with our heads literally in the clouds so few good views beyond the beautiful wildflowers. Dog Mountain was especially rough for us having walked 20,000 steps the day before. Not to mention it is essentially all uphill with some sections being rather steep. 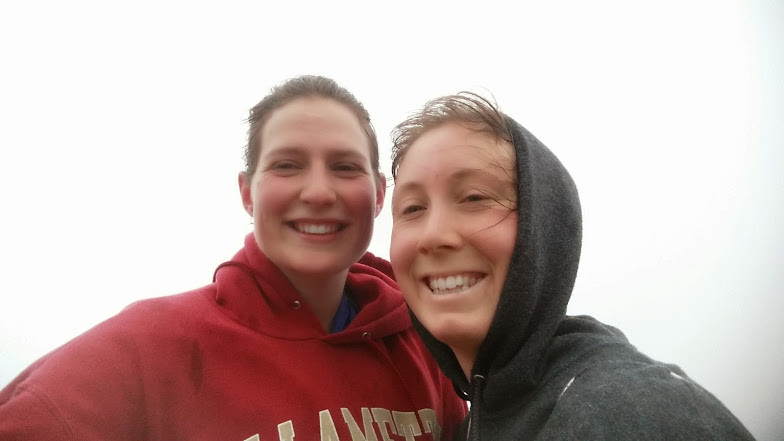 The muddy sections were tough without hiking shoes, which neither of us had. We aren’t even positive we made it to the end. We took a different route down which was equally if not more muddy but had fewer people and may have been faster. 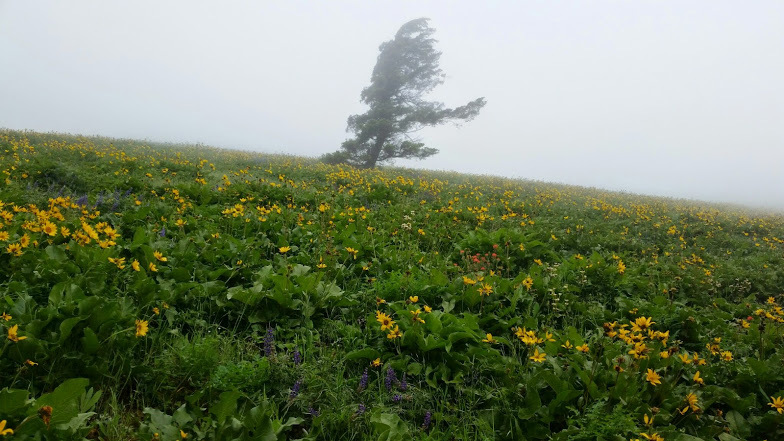 The wildflowers were marvelous but it was hard to enjoy marveling in the wet, windy, cold conditions we encountered when we reached the wildflower hillsides. It was laughable how miserable we were when we reached the top. We had definitely chosen the wrong day. I can say this with certainty because in the week before and following this hike I had three different friends post gorgeous pictures of the views they had on their Dog Mountain hike. 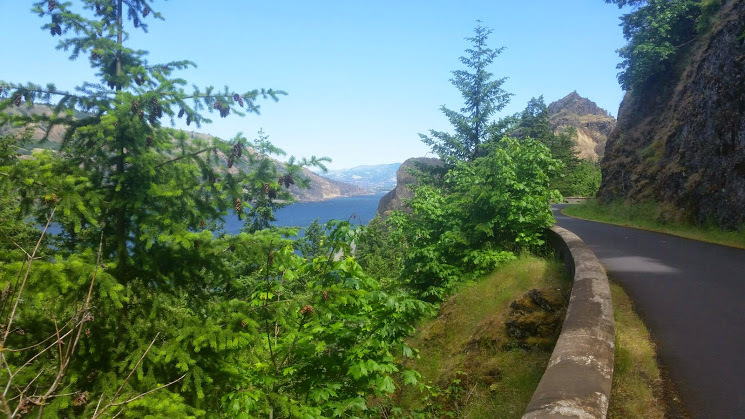 The hike we did the day before was Historic Columbia River Highway State Trail. It used to be part of a scenic highway so it was completely paved and thus apparently a popular cycling place. The two tunnels were cool but early on in the hike so the rest is a bit anti climatic. 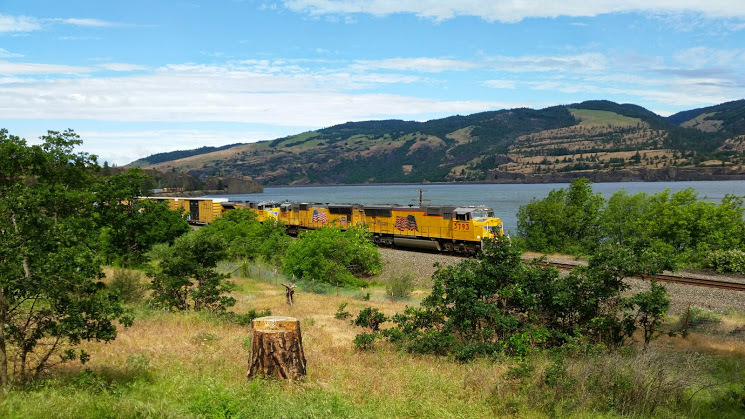 This hike did provide some views of the Columbia which were pretty and perhaps worth writing home about if you had a spare stamp. The hike just kept going and going and going. We made little effort to walk at anything but a leisurely pace which may have contributed to the never ending sensation we experienced. For the record, Monday we had a lovely day of rest and recovered from the hikes and the disappointments. It was well worth it. 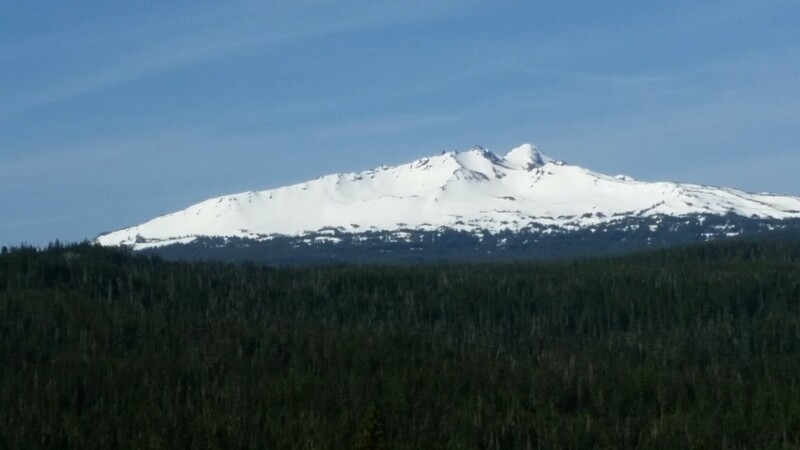 This picture was taken from our campsite. It was windy. I mean, very windy. Which wasn’t pleasant. 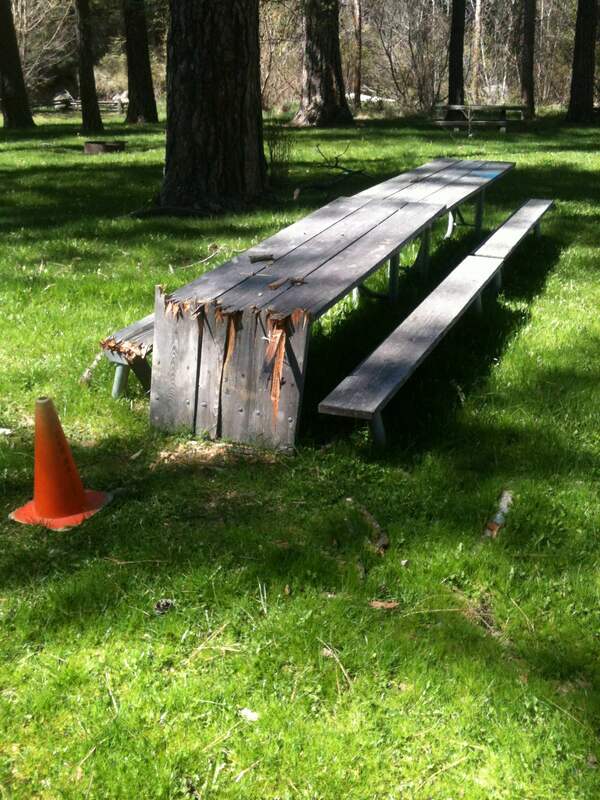 I’m not sure how often out of the year this park is windy, but I would not recommend going over Memorial Day weekend. Because if it’s windy one year, it’s bound to be windy every year, right? The wind made it not very fun to be outside because anything not nailed down would blow away and it also made it not very fun to be inside the tent because it was basically collapsing on us. 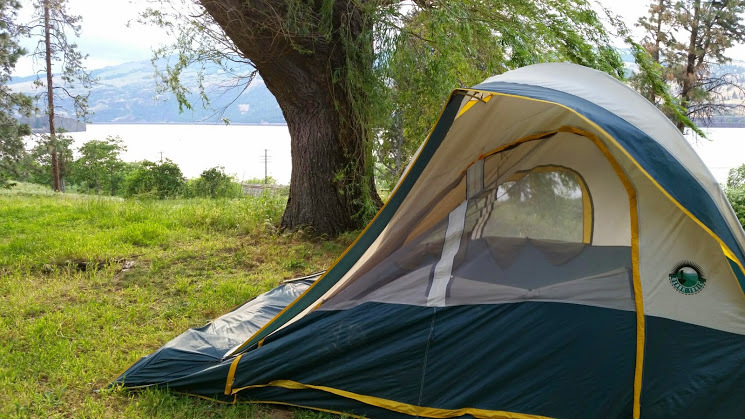 With a better tent it would have been more bearable but we prefer camping that’s not just tolerable but enjoyable. The park itself was attached to a rest stop right off the highway, so the location wasn’t great. There wasn’t any access to the river either since the train tracks were in between. Speaking of the train… we could also hear it in the middle of the night which wasn’t pleasant. The bathroom was also tiny and consistently out of supplies. On the upside, there was good proximity to hikes and the view of the river was gorgeous. Two birds with one lake, that’s how the saying goes right? 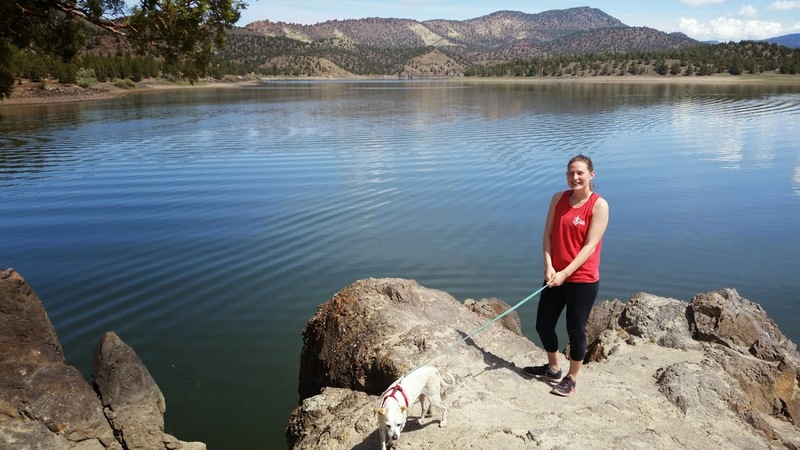 What seems like a year ago, we went to Prineville Reservoir and Jasper Point (also located on the reservoir). We got in late Friday night May 15th to Prineville Reservoir which seems to becoming a Friday night routine these days. The routine goes as follows: leave work, drive to site, put up the tent, set up the sleeping bags, go to sleep. We did have a little surprise in the wee hours of the morning when Nina heard some rustling right outside our tent. It sounded like there was a small animal attempting to get into our tent. Nina sprang upright and blurted out, “Where’s Sir? !” It turns out the animal outside our tent was our own. One of us (lets be real it was probably me) left one of the tent doors unzipped a little bit and our stinker, Sir, wandered outside in the middle of the night and couldn’t find the door again. Oops! He was safely retrieved. After some not so restful sleep we got up, ate I’m sure though I can’t remember for certain, and then took a relaxing walked along the lake and park. Worrying that we might not get a spot at Jasper Point because it is first come first served park, we packed up and drove up there, a mere 10 minute drive. Lucky for us, there were plenty of spots available and we picked one that looked out on the lake. We are getting very good at setting up and putting down camp. We have a whole system but perhaps I’ll divulge the boring details of our system in another blog post! Later, we walked a trail that led to nowhere in particular but was still an enjoyable walk around the lake. We let Sir off leash some which he loved, but when he ate poop we decided that was enough of that and put him back on the leash. We also sat with our view of the lake and read. Very pleasant! 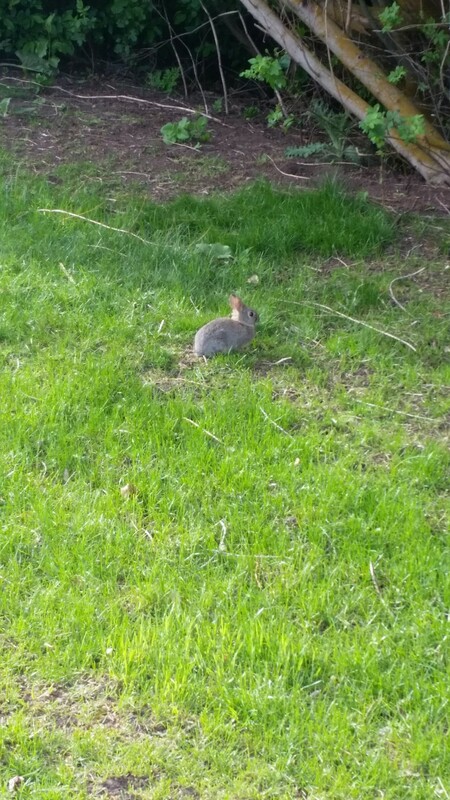 there were jackrabbits scurrying around the park! 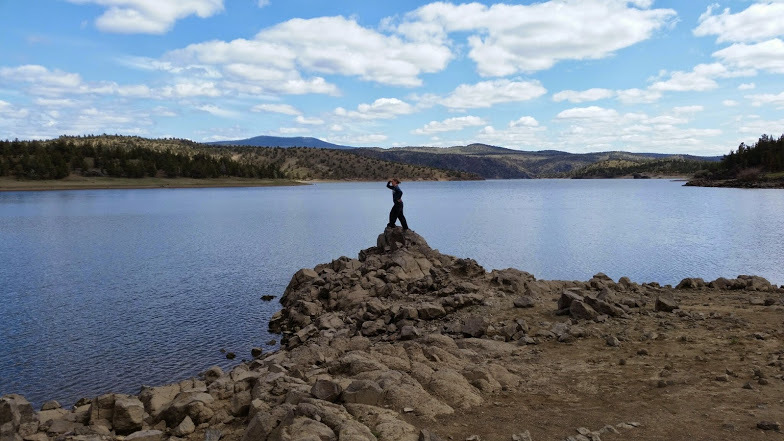 Prineville Reservoir happened to be having their annual star party Saturday night so we checked that out. They had 5 or 6 telescopes out and we got to look at Venus and Jupiter and could even see Jupiter’s moons! It was crowded and you had to wait in line to look through the telescopes but it was still a fun and rare (at least to us) experience. Presumably we would have seen even more had we stayed later but we were tired so we drove back to Jasper Point and went to bed. Even when we’re camping, we’re old and boring and can’t party too late into the night, even at a star party. The sites were good sized and very close to the water so the view was great. There was a nice day use area that included: volleyball, swimming, boat launch, fishing, fish cleaning, horse shoes and picnic tables. We didn’t stay here too long. This one was first come first served which stressed us out because we weren’t guaranteed to have a site. The location made up for the stress though- we were literally right on the water and the view of the lake was gorgeous. The site felt fairly private so that was nice. However, the park was a bit on the pricier side. The bathroom facilities weren’t great- dump toilets. And get ready to squat! The toilets were quite low to the ground. 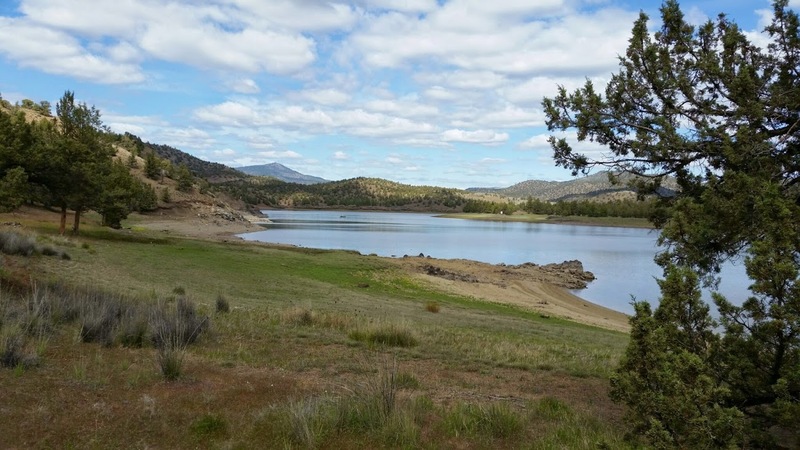 The day use area wasn’t as elaborate as Prineville Reservoir- just a boat launch. The trail we took was quite nice, though it wasn’t good for small paws as Sir kept getting small ouchy things stuck in his paws. A definite plus was that for $5 we got a ton of wood- more than double what most places give out for $5. Posted on June 16, 2015 July 24, 2015 1 Comment on Two birds with one lake, that’s how the saying goes right? We left very early (for us) on Saturday (May 9th) morning. About two minutes into our drive we stopped at Bagels and Beyond. We got some very delicious bagels which made the early morning a little less painful. It was a six hour drive so leaving after work on Friday was not really an option. 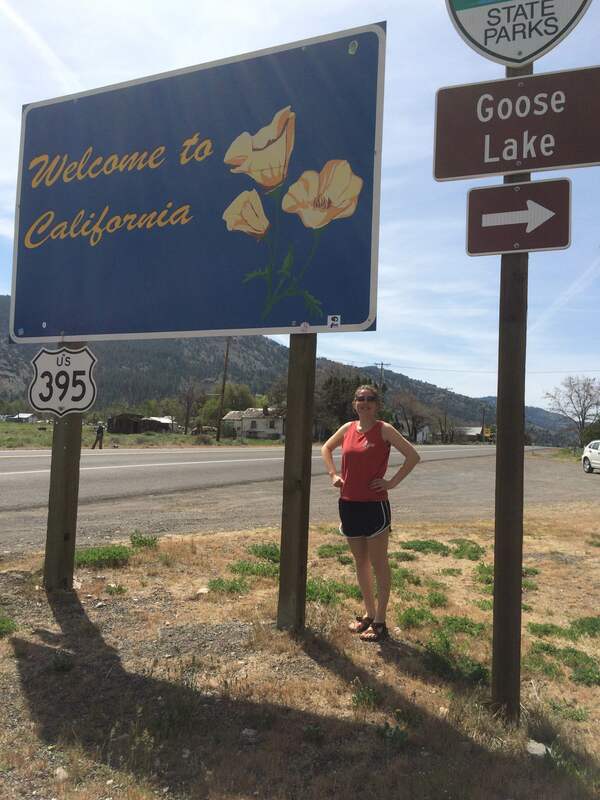 We made a couple noteworthy stops along the way. It really helped break up our drive. Besides Bagels and Beyond, we also stopped at a viewpoint for Diamond Peak and for gas. We highly recommend taking a couple stops! 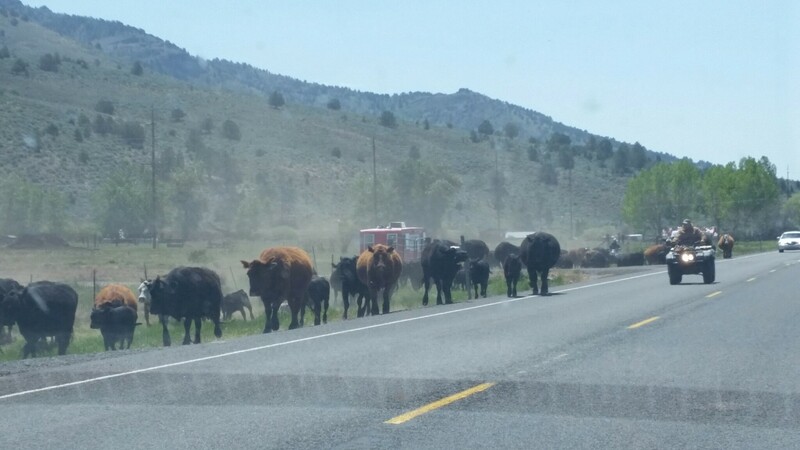 We were also forced to considerably slow down when a rancher was moving his cattle somewhere and they were happily trotting down the middle of the road. That’s not something we see every day! Another thing you don’t see every day is a confederate flag. We saw one as we were driving through Lakeview, the small town just north of the campground. It’s definitely a privilege for us as White cis women who can pass as straight to be able to do this camping challenge. That’s not the case for everybody, as Oregon isn’t necessarily that accepting, especially outside of the Willamette valley. 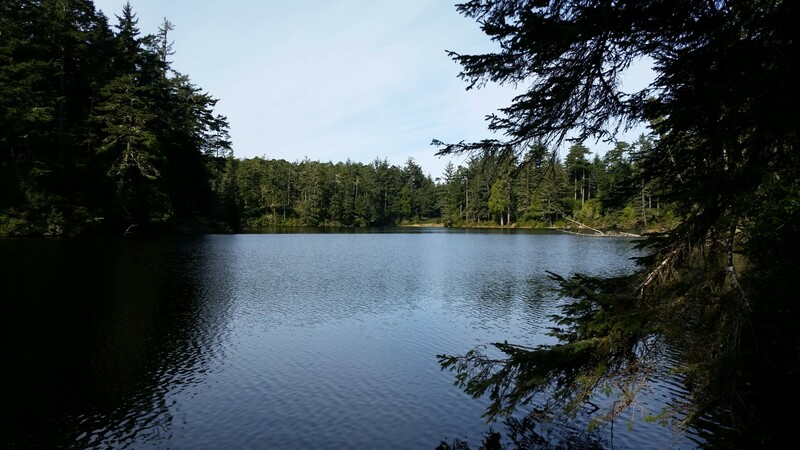 We got to Goose Lake around noon so we had just over 24 hours there. Upon arrival, we walked around the campgrounds a little bit and had lunch. After lunch we walked down to the lake. The lake was a little disappointing to say the least. The drought has not been easy on this area. 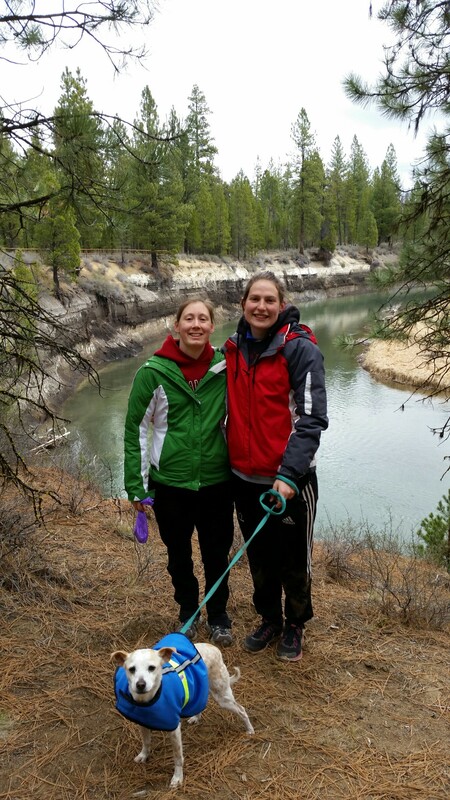 As we walked back from the lake, one of the camp hosts recommended we explore the nearby creek so we moseyed on down that way. 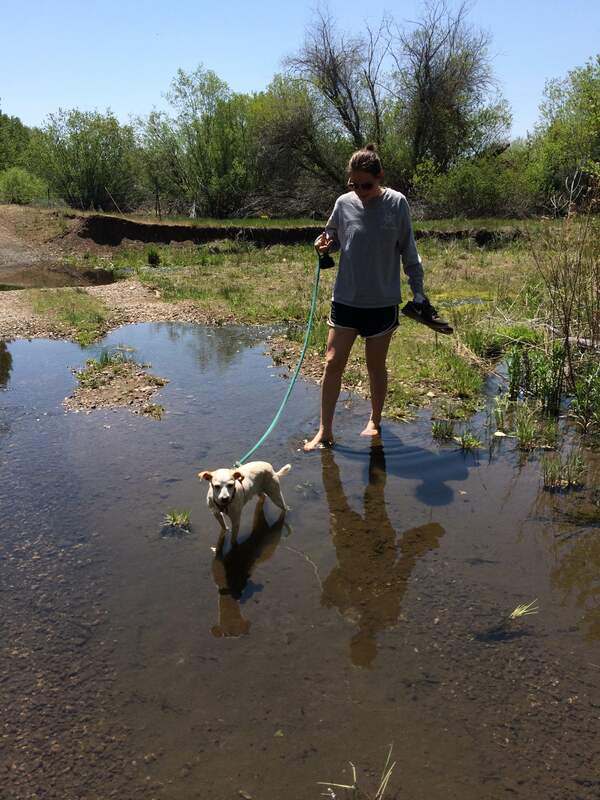 We all put our toes in the chilly water, even Sir- though he wasn’t a fan. 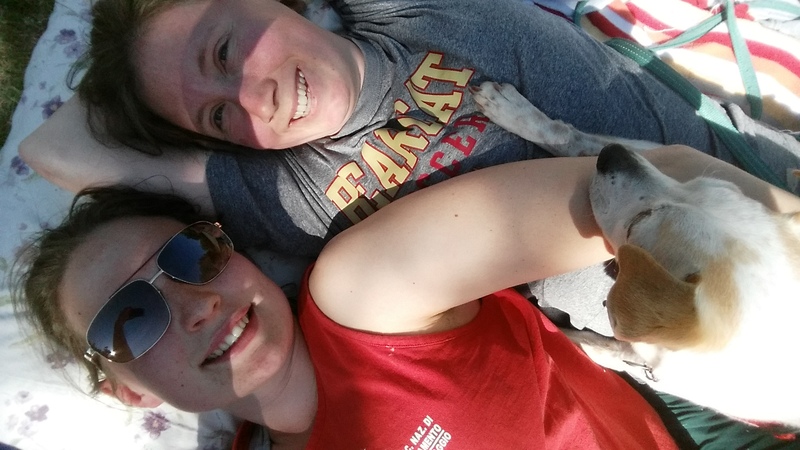 We spent most of the rest of the afternoon laying out on a blanket in the sunshine. 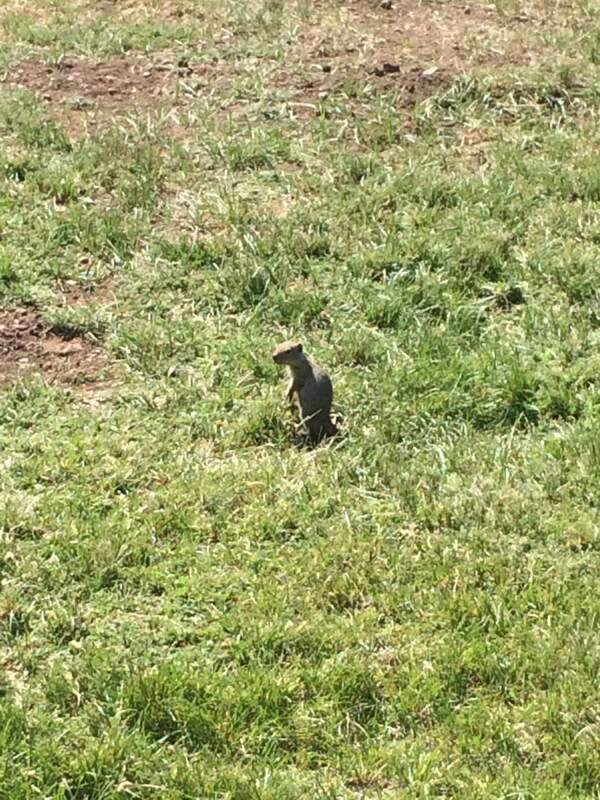 I enjoyed watching all the little prairie dog/gopher things run around and napped while Nina read. Finally, at Nina’s insistence we set up our tent. The next day we walked the nature trail around the campgrounds. It wove in and out through wooded sections and grassy sections. It was a very pleasant walk. 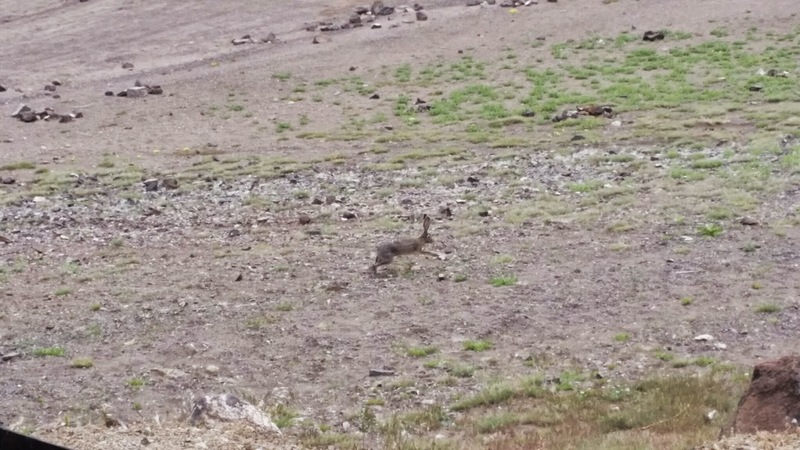 During our time at Goose Lake we saw a ton of different birds including robins, woodpeckers, and plenty more we don’t know the names of, rabbits including one bunny, and probably a hundred gopher/prairie dog things. We also saw deer, jack rabbits, and all sorts of farm animals on the way to/from Goose Lake. On our drive home, we stopped and did a hike. It was beautiful and we were literally the only ones on the trail. That’s always nice so we can let Sir off leash. At one point, it got pretty buggy though and we both got some mosquito bite souvenirs! The wildflowers were really pretty. 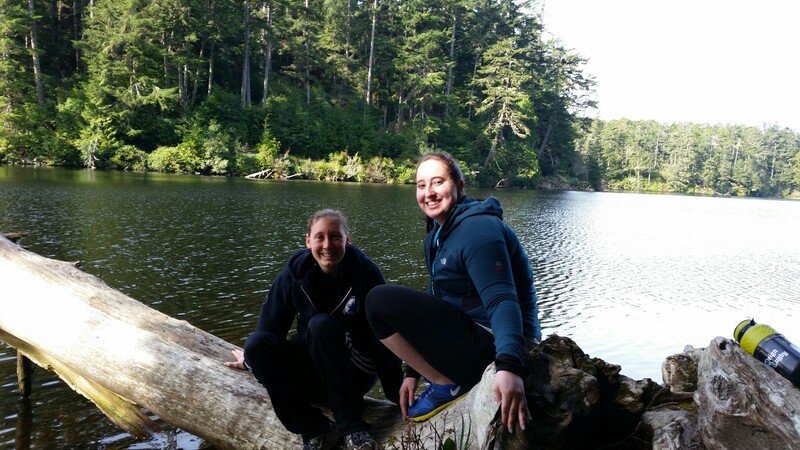 At first we weren’t really feeling Goose Lake but over the course of the 24 hours it really grew on us. The birds and nature sounds were a big plus. According to the brochure, the campsite is also a good spot for birding. The campsites themselves were pretty big and spacious, though not that private. 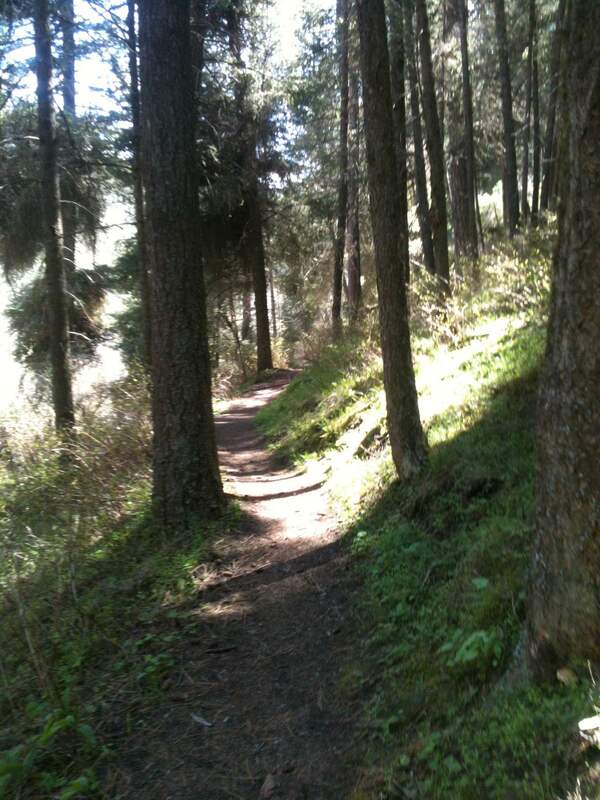 The trail around the campground was nice, but it was definitely just a walk, not a hike since it was pretty short. A definite downside was how far the campsite was from home. If we had more time, we would’ve stopped at the antelope refuge, which was just a couple hours away from the campsite. On our drive back, we wanted to break it up with a hike. Unfortunately, the signage was really poor about where the trailheads were. We stopped at a few historic marker kiosks that had some neat history. The kiosks all included a map and had areas where trails supposedly were. However, those trails were very hard to find. We ended up doing a different hike that I (Nina) just happened to see a sign for along the road. Overall, it was a nice campground. Wouldn’t go there again just to go the campsite, but if we were ever passing through on our way to California, we could stay there. 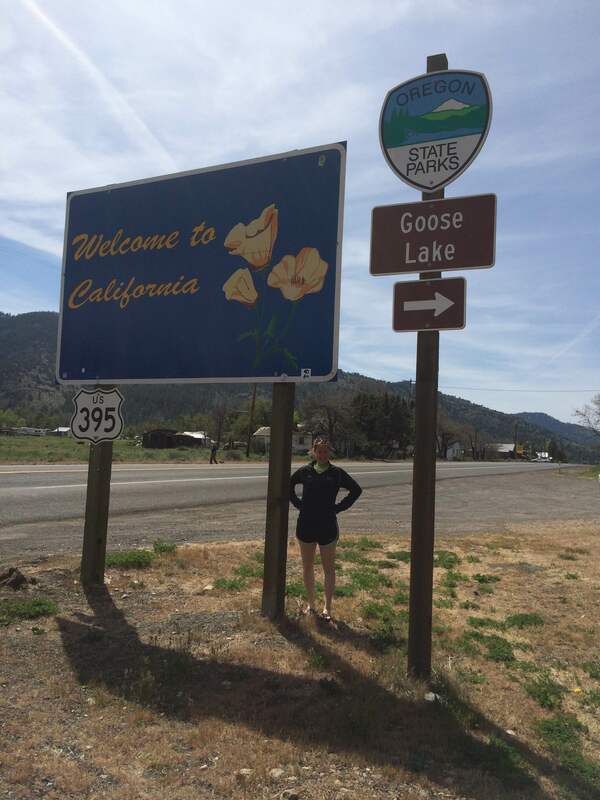 Posted on May 27, 2015 May 27, 2015 Leave a comment on Duck, duck, goose lake! Red bridge? More like no bridge! We had planned to camp at Hilgard Junction the weekend of April 24-26th. Now, understand, that this is a 5.5 hour drive that we did after work on Friday. We were excited to get to the exit and it was about 10:30. When we pulled up, the gates were closed! The campground hadn’t opened yet! We were VERY annoyed because online it said it was going to be open. And we were pretty tired, and it was dark, we don’t know our way around that part of Oregon very well, so it was pretty worrisome. Thankfully I (Nina) looked up the campsite we were planning on staying at on Saturday night, and it was only about 20 minutes away. We drove there, crossing our fingers it would be open and have space available. Along the way, it was a creepy drive and we went past what looked like to be a juvenile detention center. When we got there, basically all of the spaces were available. We couldn’t decide if it was creepy or if we were glad that there was only one RV there. Decided not to dwell on it, set up our tent and went to sleep! The next morning, the RV had left so we had a wonderful morning- skies were blue, we let Sir off leash which he absolutely LOVED. He got so good at coming when we called him and gave him treats. About mid morning, we were enjoying our hot chocolate, just about to start packing a lunch for later, when the clouds started coming in. Clouds are okay. But then suddenly the hail started!! We rushed to put everything away, and hurried into cover in the tent. We laughed and laughed, we could not believe it was hailing. Beth was a great girlfriend, and got out into the hail to fix our stakes and rainfly so that the hail wouldn’t pool on the tent and cause leaking. Lucky for us, within half an hour the hail stopped. 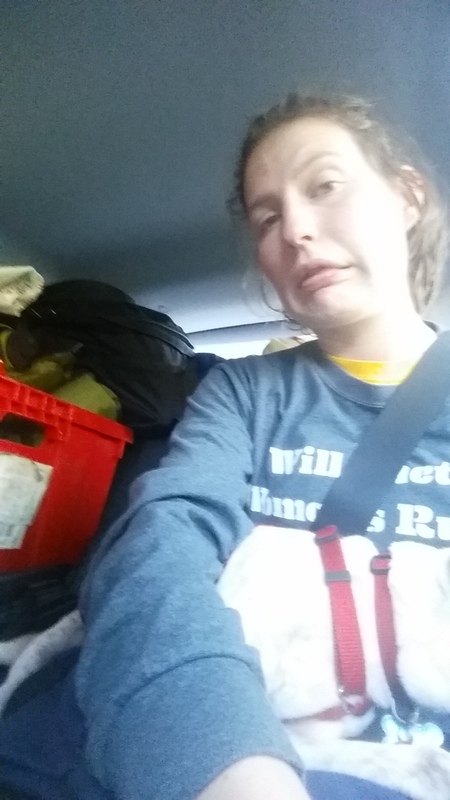 We dashed to pack up the car before the crazy weather started again. We decided to go to Catherine Creek next. It was about a 45 min drive. When we got there, again there was only one other camper there. 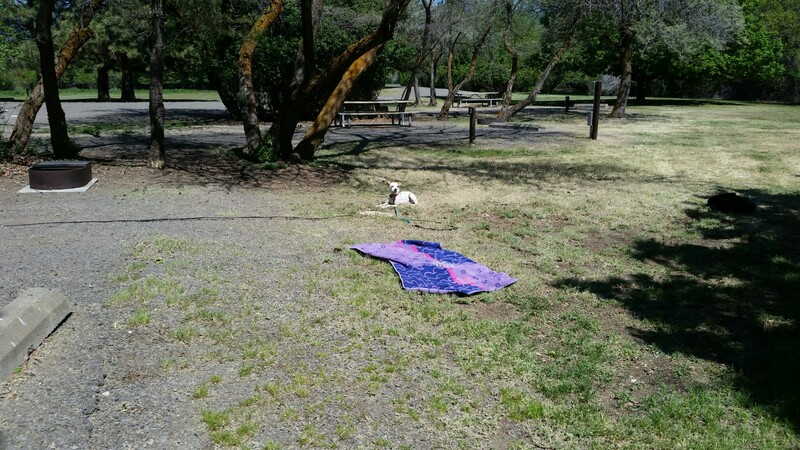 It is a strange thing having a campground basically to yourself! We found a nice site next to the creek. We went on a hike which was nice! The signage wasn’t great so it felt a little like a choose your own adventure book but we found our way to a couple pretty viewpoints and back the campsite. That’s what’s important, right? After that we enjoyed a drink while sitting next to the creek on a well-placed log. It was very relaxing! The peaceful moment did get a ruined a little bit by some teenagers taking selfies on the bridge nearby but what can you do? We had some reheated veggie soup for dinner and sat by the fire. The next day we walked over to the day use area which is accessible by trail from the campground. It looked like a storm had hit it recently because there were tons of down branches and even some fallen trees. Otherwise, it seemed like a nice park. The creek is a part time home to spawning Salmon but we did not see any. We packed some lunches and hit the road shortly after exploring the day use area. Looks like a storm hit! The tent area was walk-in, so we stayed in an RV spot which was only 6 bucks! We couldn’t believe it. The RV sites were pretty good sized, some were more private than others. About half of the sites were up against a road. The road that wasn’t too busy, but cars went by pretty fast and you could definitely hear every car that went by. There were some good walk-in tent area spots- right by the creek. There was also a horseshoe area, which we have seen at quite a few state parks. Beth is very insistent that we get some horse shoes so we can play it. What we thought was interesting, there was no host but they had firewood out for sale. The system was very trusting- in that you took whatever wood you wanted and were supposed to pay for it in a little pay station right by it. A big downer for this site was the misleading name! There was no red bridge whatsoever to speak of. Also- there didn’t seem to be much to do in the area. Catherine Creek was very similar to Red Bridge on a lot of counts. It had some sites right near the road and others were off the road a bit more. Some sites were more open, while others were more private though open sites seem to dominate. It also had no host with wood for sale. This campground was inexpensive! (woohoo!) Finally, it also had a horseshoe area! We really need some horseshoes! (Who wants to buy us some?) 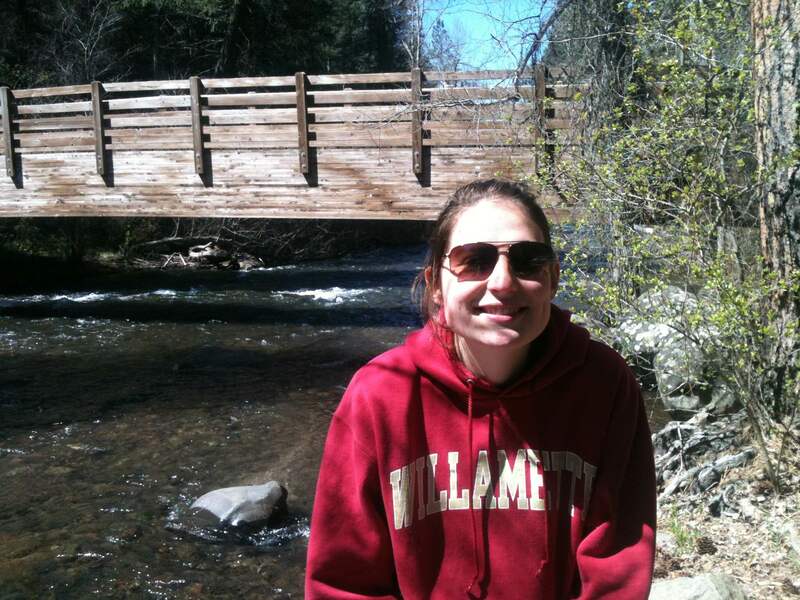 The creek was very nice and the bridges both looked new! 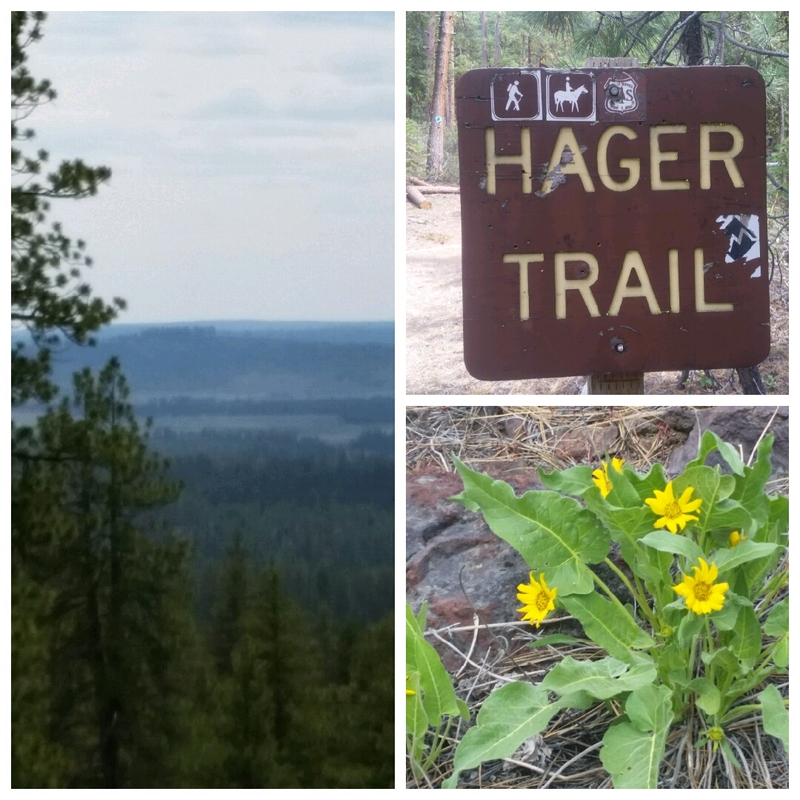 The trails were pleasant despite the little signage. There was a hand drawn map on the informational board but it was hard to a. remember what it looked like once we left the board and b. put a whole lot of stake in a hand drawn map with few memorable details. I wouldn’t want to stay here if it was ever full but we enjoyed our stay at Catherine Creek when it essentially all to ourselves! Coming up, blog posts about..
17 sites down, 29 to go! Posted on May 26, 2015 Leave a comment on Red bridge? More like no bridge! Plan A was to camp at Saddle Mountain on our way back from our rugby game in Tacoma. However, since it was such a beautiful day and there were only 10 first come first serve sites, we decided not to risk it. 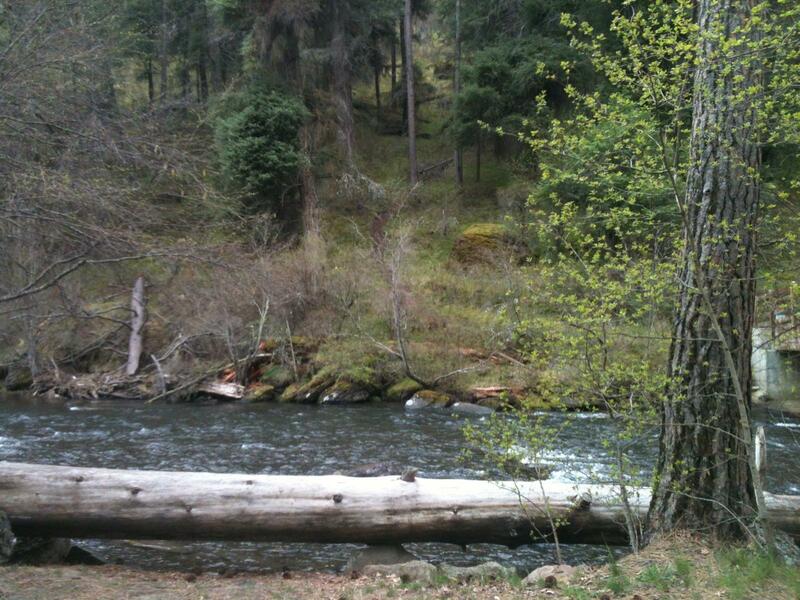 Plan B was to camp at Milo McIver State Park. This park is a little east of Portland. When we were almost there, a deer ran across the road right in front of us! Gave us quite a scare. We arrived right before the sun went down (which would’ve been perfect timing to get our tent up before dark) but it was full! We couldn’t believe it. Plan C was to stop at Champoeg State Park which is not too far from Salem. It’s got tons of sites so we thought we would be able to get one. But when we got there, it was also full! Dang that good weather! Messing up our plans. Since it was late and we were exhausted from rugby, we ended up just driving back to Salem. The next day I went and reserved all of our sites for the summer, to avoid this issue in the future! I couldn’t believe it- for two campgrounds in August I literally reserved the last site! Posted on May 6, 2015 May 26, 2015 Leave a comment on Third time was not the charm. We left friday after work so it was late and dark. We had to set-up the tent in the dark and then Beth accidentally punched a tree in the dark and it hurt. We don’t recommend it. Cassandra from the rugby team joined us a little bit after we got there as well. Sir was a good boy! We think he might not have noticed that she was there. We were pretty tired because it was pretty late at that point so we just went to sleep. 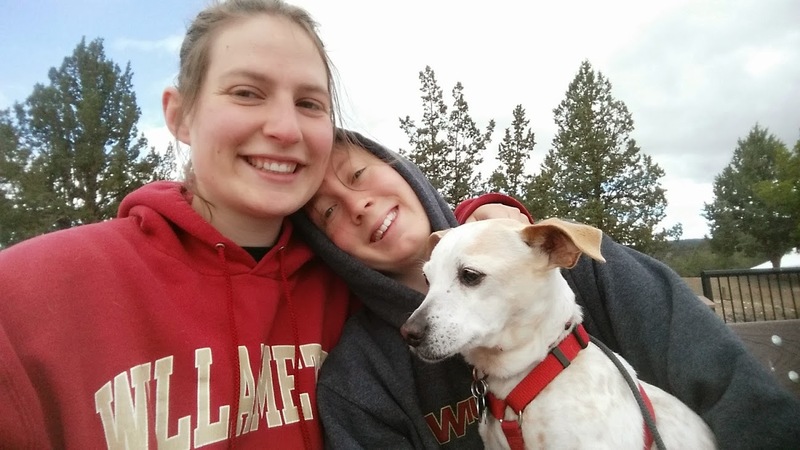 We got up in the morning and had some mediocre oatmeal breakfast and then we packed up, and walked along a trail and the deschutes river was all around us, as per the signs. 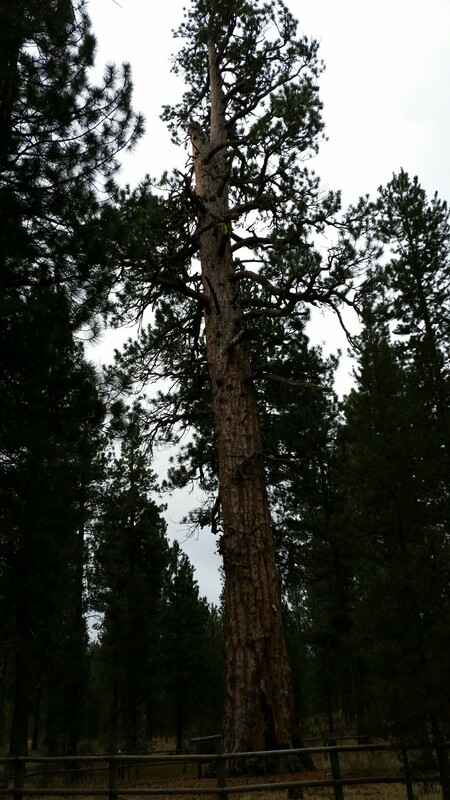 And then we stopped and saw the biggest ponderosa pine! it was fairly humongous! We were moderately impressed. Next, we went to play rugby. We had all the weathers- a little bit of sun, a little bit of rain, a little bit of snow, and a little wind. That’s all we really want to say about the rugby game. One good thing was the Bend team fed us DELICIOUS tacos at the social, though we did have to wait a while. Then we were off to camp again! We drove up to Smith Rock and the views were stunning. We did a short hike called Rope-a-dope trail and had just enough time to watch some of the last climbers before they were done for the day. We were very tired so setting up the tent was a chore. Plus it was very windy so it was a little more difficult than usual to set it up. Once we got set-up, we grabbed some snacks to put in the tent and basically went to bed. We were exhausted. It was only 8 o’clock but we did not leave the tent for another 12 hours. In the morning, we decided not get out of our sleeping bag until it reached 32 degrees, despite having stayed in them for 12 hours. We got up, went to the communal cooking area and had a tasty breakfast. Afterwards, Beth went to take down the tent and I made lunches. This is when the terrible accident happened. I dropped my new-ish phone face down! On gravel rocks! The screen was cracked and pretty soon I couldn’t see anything at all on it. 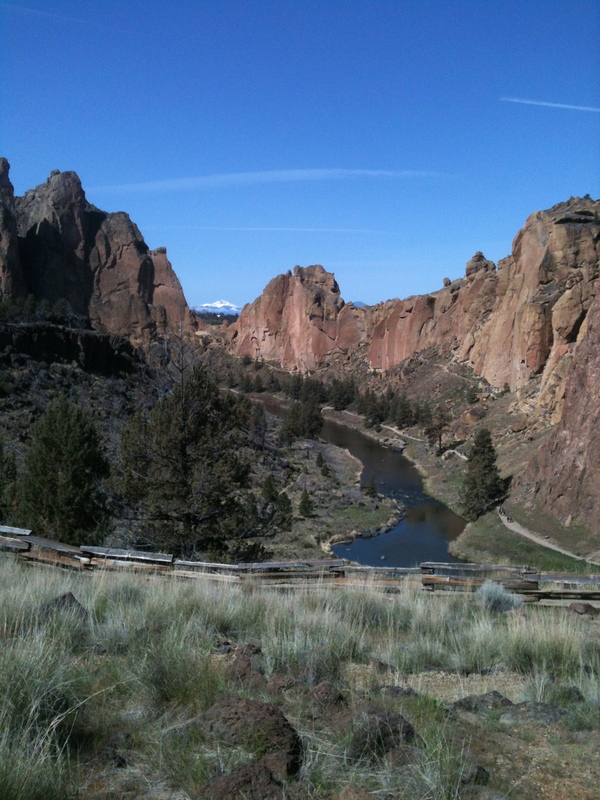 Then we did the river trail around smith rock. We decided not to do the “misery trail” that was straight up. Our legs were still quite tired from the rugby game, plus there were too many people around for Sir. However, the river trail was quite peaceful and beautiful, once we got past the loads of climbers. 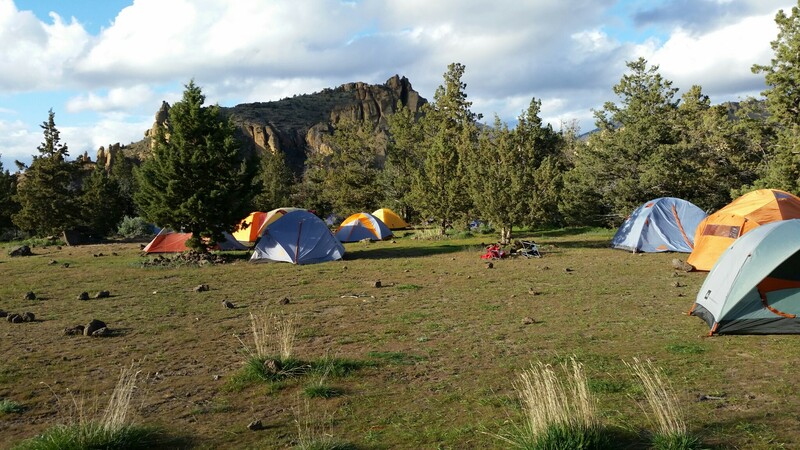 LaPine: Our site was good because we were able to put our tent far back in the trees, but most of the sites were pretty open and not very private. That’s just how that area is- it’s very desert-y over on the east side of Oregon. The trail we did was nice and leisurely, and there were no other people on it. However, we did have to drive to the trailhead. Overall, it was fine, but not that great. The Ponderosa pine was cool if you don’t have super high expectations for it. It is just a tree. 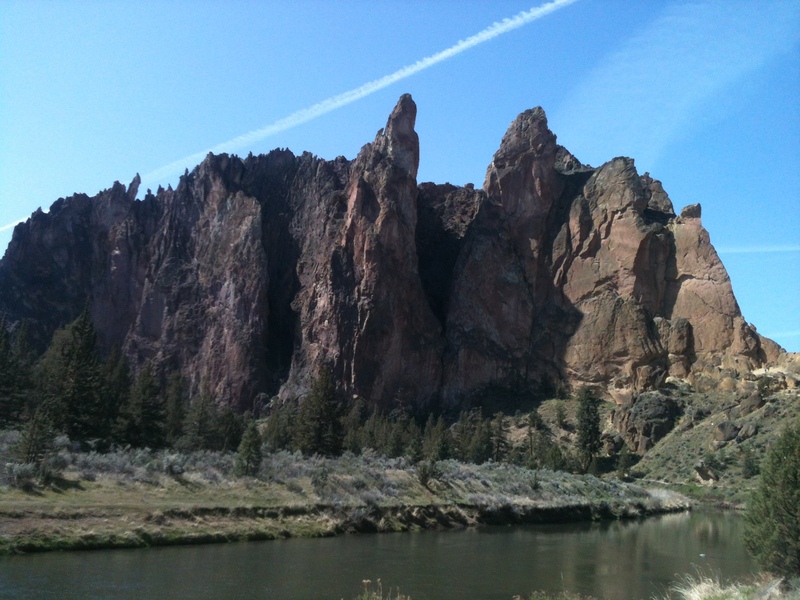 Smith Rock: Was beautiful but a totally different camping experience for us. We felt self-conscious of our huge 6 person tent since everyone else had little 2 person backpacking tents. This was unique because we had to park and walk-in. As you can see, it was pretty open and you could just pick a site wherever. There aren’t any designated sites, it was just wherever you could find a spot for your tent. The cooking was all in a communal area near by the parking. I didn’t mind it, but my preference would be to have my own site. Good to know what you’re getting into. 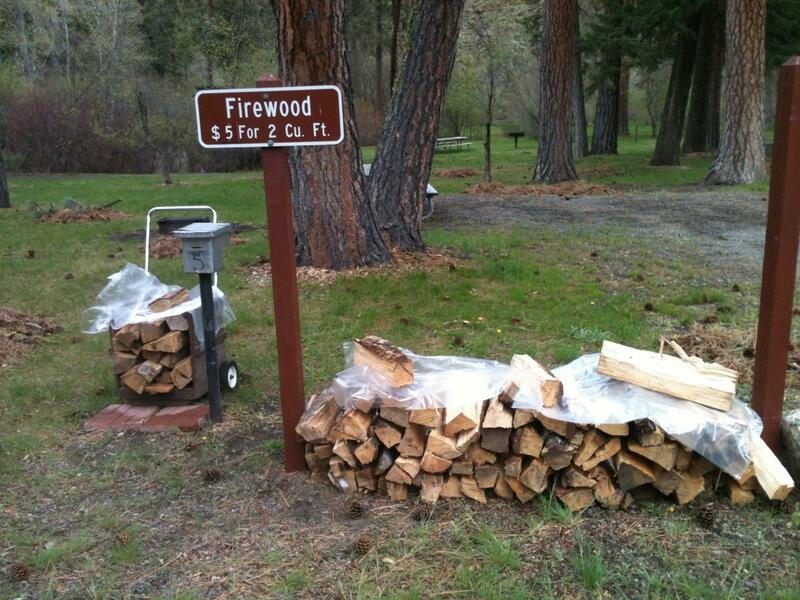 There were no fire rings or fires allowed, so don’t count on any s’mores. There were lots of hikes to do, but there was also a ton of people there and it was only April! Overall, the views were so spectacular, I would love to go back again. We got to the campsite right when the sun had gone down, so we had a little bit of light to set up. The campsite we chose was fairly private- though it didn’t matter too much because there wasn’t anyone in any of the sites right around us. 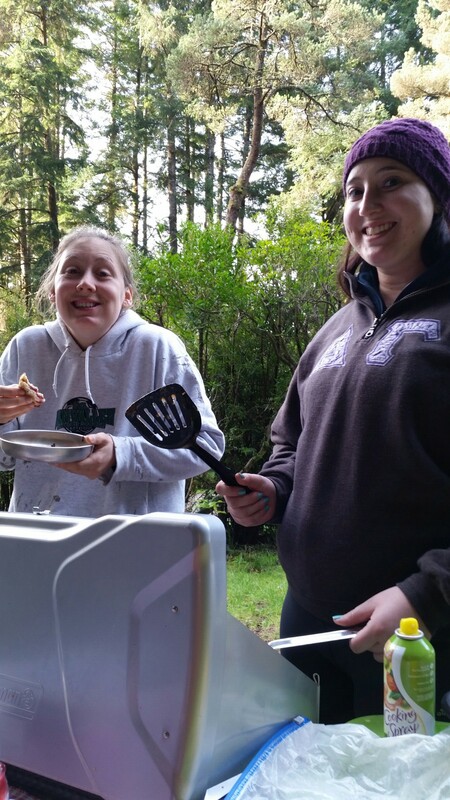 Lauren had prepared stuff for tacos- so we heated that up and then had a delicious dinner! We had s’mores for dessert. Mmm! The next morning, we made pancakes! And used the yummy syrup that Beth’s friend Caitie had made. It was delicious! 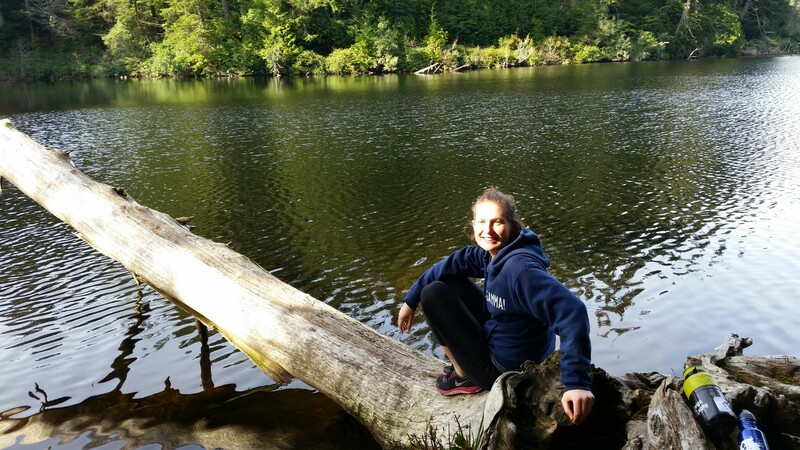 We went for a hike/walk around the lake- it was again, beautiful weather! The loop around the lake led us to the lighthouse which was cute looking. It was a quick trip, felt like we had to leave too soon! I had so much fun camping with Nina, Beth and Sir! It was just like old times when I lived with Nina. Except outside. In a tent. And colder. But still fun! It was great to be outside and get some fresh air. We went hiking and saw a great lighthouse. All in all it was a fun weekend and I can’t wait to go again! It was nice that we could walk right to the lake from the campsite. The trail around the lake was nice and led us almost right up to the lighthouse and a beautiful view of the ocean. Unfortunately there wasn’t any beach access from the park so that was too bad. Our campsite was pretty private and spacious which was good. They had cabins and yurts there and some of the cabins looked out onto the lake so if you’re more of a cabin type person this would probably be an especially pretty spot to stay. All in all, a solid spot to camp.